When using Freemarker in Magnolia, you often get errors. For example, because you tried to use an undefined value and didn’t add the required ‘!’ symbol. 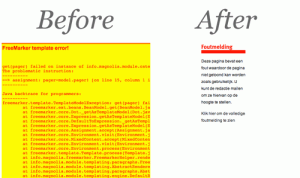 When that happens you see the infamous red-on-yellow “FreeMarker template error!”. During development, that’s not a problem, but on a production site you don’t want to confuse your visitors with cryptic Java errors. Unfortunately, it’s not that easy to turn those errors off, and you probably do want people to report these errors because they might indicate a serious bug in your website. To view the script read the Magnolia wiki page.